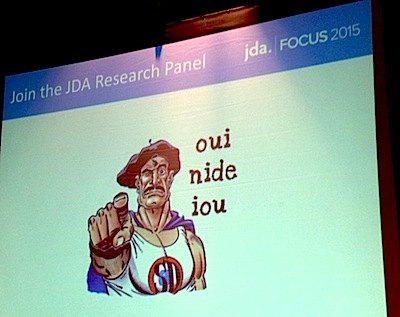 Updates and Insights from JDA's FOCUS 2015 Conference. There was a clear message that the customer was the focus of everything JDA does. Dail admitted that in the past maybe JDA had gotten away from listening to their customers, and thus, his passion to ingrain customer in the center of all they do was outlined in the JDA Customer Advocacy initiatives. These include: the Voice of the Customer Survey, Customer Advisory Board, investing in and expanding the Special Interest Groups (SIGs), JDA Education Services roadshows, the Customer Appreciation Program, as well as the User Experience investments (more on that later) they are making to modernize their products. JDA invests about $125 million in R&D. “That is the biggest concentration of R&D in the supply chain and bigger than our next largest competitors’ entire revenues,” Dail went on to say. Investments are not just being made in the software product, but in services, support, and customer advocacy, validating that it’s great people that make companies and their customers successful, too. Supply Chain is going through a renaissance catalyzed by Omni, Digital Manufacturing, IoT, globalization, and the striving of brand companies to innovate new products and services.2 Dail pointed to the challenges JDA’s customers are facing with an increasingly competitive landscape, a changing demanding customer base, challenging economics on a global scale, and of course the tidal wave of technologies that users have to confront and master. To that end, JDA’s mission is to provide a cohesive product line and a user experience that makes the user more productive and allows the enterprise to master their new reality. 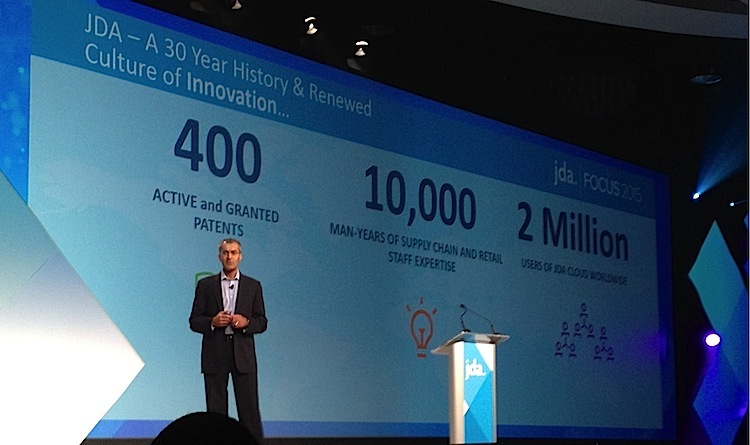 One of the key themes we heard repeatedly from JDA executives was “The New JDA.” JDA was founded three decades ago, so it is fair to ask what’s really new about it. As mentioned above, JDA spends $125M per year on R&D. About 10% of that budget is for JDA Labs, the “R” part of R&D. JDA is clearly investing heavily in new capabilities and innovations (see “JDA Labs” below). Other areas of product investment include things like new retail systems, smarter Omni-channel, Flowcasting, and inter-enterprise synchronization, WMS/TMS integration, and much more. JDA has acquired many functionally rich, complex supply chain solutions from the likes of E3, Manugistics, i2, and most recently, RedPrairie. The rationalization and merging of the suites, especially Manugistics and i2, has been a multi-year effort that is largely complete. It has now allowed the focus to shift to broader architectural integration and UX congruence and modernization. To this end, JDA has developed JDA.FLEX, which will be used to integrate data and workflows across solutions and across inter-enterprise boundaries. Part of the new JDA is JDA Labs, announced in October last year as their “innovation incubator.” It is a significant commitment, more than $10M a year, driven from the CEO’s office. One employee told us they couldn’t envision this happening even just a couple of years ago. JDA Labs is working with customers on how they can apply existing and emerging technology innovations—such as mobile, cloud, machine learning, predictive analytics, internet of things, and wearable devices—many of which did not exist in a useable form back when the initial generation of JDA’s supply chain platforms were created. JDA said this investment is a response to shifts in their clients’ businesses that are forcing new business models and pushing JDA to do things differently. JDA Labs is looking to create quantum leaps, many of which will have an impact not just in the short run, but over a longer time horizon. JDA Labs has a lot of smart people tracking innovations. When it comes to figuring out exactly how to apply those new technologies to specific business processes and problems, the Labs folks don’t go too far without involving a few strategic customers. Not all customers are ready for this, so JDA teams with those 10%-20% that are ready and looking to disrupt "business as usual." JDA Labs spends a lot of time with customers on co-innovation strategies, not just to validate the ideas, but to speed up time-to-market. This is an area where they are applying the new User Experience3 methods (Figure 1). JDA ‘Ghosts’ can become a low profile way of understanding the user’s needs and developing new systems, new interfaces, workflow and methods of working that transcend the system. JDA launched a significant Omni-channel-centric partnership with IBM, announced last year, integrating IBM’s Distributed Order Management capabilities with JDA’s supply chain planning and execution. This enables Omni-channel orders to be fulfilled in the most profitable way. They expect that to go live at the end of this quarter. At FOCUS, JDA also announced a new partnership with Google to use Google Cloud Platform as JDA’s preferred PaaS4 for existing and new cloud implementations. They expect to leverage other Google technology going forward as well, such as consumer analytics. JDA customers span from mid-size to mega, across industrial, process, food and beverage, and Life Sciences and Retail—the largest install base of any supply chain technology company. Thus the conference was packed5 with real world implementation stories and lessons learned from small to large 3PLs, manufacturers; and retailer turnaround stories. Everybody talks about supply chains providing customer service, but at Edwards, a long time JDA customer, it’s a matter of life or death. Edwards, a provider of heart valves and other medical devices, is a leader in their space. John Washington, Senior Director, Global Supply Chain, Edwards Lifesciences talked about their journey from less than stellar performance to world class. Medical devices have big challenges—they are perishable and yet certain products are re-usable. But if they sit in stock they need to be returned and re-sterilized. So keeping service levels high is not just a matter of stuffing the hospital with supply. In fact with the Affordable Care Act, many hospitals have been trying to adopt leaner, more just in time practices. This puts increased pressure on critical suppliers such as Edwards. Change required the metric-centric supply chain thinkers to come to agreement with what Washington called the aspirational forecasts of the sales team, to not only significantly improving their on-time/accurate fulfillment, but doing this while reducing cost and obsolesce. Parcel shipping is a hot and growing area for logistics service companies. However, not everyone knows how to do it and make money at it. MD Logistics, a mid-size 3PL, is a WMS customer of JDA. They also use a partner, Agile, for the parcel TMS functions. MD Logstics’ story was interesting, not only because automating the warehouse and integrating into the parcel shipping capability allowed them to greatly enhance their productivity, but because that also allowed them to take on new business using the same headcount. Everybody’s dream, right? Grow the business without spending much to get there! Thus, the power of great technology and knowledgeable people to help these types of projects succeed. A big retail turnaround story is Loblaws. Bruce Burrow, Chief Information Officer at Loblaws, talked about their long-term relationship with JDA and their journey to becoming one of Canada’s largest and most admired companies. This required intense focus on inventory management, accurate data management, significant policy changes from the store to logistics, with many systems and processes to align. Rich Beck, SVP, PepsiCo Global S.C. Operations, talked about their 20-year history with JDA6 and the mutual commitment to raise the bar of supply chain performance across the world. Both of these companies used SAP, but chose and stayed with JDA. Rich Beck used some terminology to describe the respective environments—SAP was the transaction system; JDA was the performance system—where they look to achieve strategic and operational improvements. An accurate distinction in the categorization and value of supply chain systems, which most supply chain executives would surely agree with. The benefits these firms experienced crossed many other customer cases we listened to: growth while maintaining or reducing cost, expanding product lines while managing complexity, reducing carbon footprints and increasing their commitment to the communities in which they operate. JDA is making significant investments in core industry sectors where innovation is needed and where supply chain systems are the core of performance such as 3PL and Manufacturing and go-go areas such as Omni-channel fulfillment (read Omni Channel in this issue) and Retail. About a year ago, JDA launched a new business unit focused on serving 3PLs.7 The business unit is, itself, a self-contained P&L center. However, its team members are embedded in a matrixed manner throughout the other groups across JDA, since 3PLs (potentially) use a huge swath of the JDA solution portfolio, but with some of their own unique requirements (such as complex multi-enterprise billing functions). JDA has built out a global field organization across the Americas, Europe, and Asia, and developed and rolled out a 3PL-specific engagement model geared to helping 3PLs differentiate themselves and win more business. Thus, unlike JDA’s traditional business that sells to supply chain and operational personnel largely for cost and efficiency gains, JDA’s 3PL team can sell to the sales and market functions all the way up to the 3PL’s CEO, because JDA can be an agent of growth for those firms. 3PLs compete not only on logistics services, but on the technology support they provide.8 JDA’s 3PL team is equipped and empowered to actually help their 3PL customers in the 3PL’s own sales pursuits by embedding a JDA salesperson and architect in their customer’s team. This required an enormous change in a software firm’s approach to sales—away from the big upfront win and toward growing the relationship as a partnership over time. JDA has developed industry-specific value propositions and functionality for 3PLs, for example, in automotive, by helping address the complexities of mass customization and globalization, enabling their 3PL customers to do light assembly, customization, and inline sequencing. In pharmaceuticals they help 3PLs meet requirements for emerging government regulations, temperature-controlled pharmaceuticals, item serialization, and so forth. JDA has been working to understand and embed 3PL industry-specific requirements in the product strategy as well as create 3PL-specific messaging and marketing collateral. JDA can help 3PLs go beyond the core warehouse and transportation functions to other value-add areas more quickly, with lower risk. 3PLs may have a desire or need to go into certain areas where they lack expertise (e.g., managing inventory). JDA can bring up those solutions in JDA’s cloud without a large upfront capital investment by the 3PL. JDA can also provide expertise through a BPO model to augment or train the 3PL … or in some case do the whole function and let their 3PL customer white label the service. This lets 3PLs quickly explore various high-margin opportunities without taking on too much risk or upfront investment. Many 3PLs want to minimize their fixed cost and maximize the percentage of their outlays that are variable cost—costs that only grow when their business grows. JDA enables that low-risk model for them. As an independent business unit within JDA, the 3PL group has been able to develop commercial models that make sense specifically for the 3PL. Further, JDA is one of very few companies with a full suite of services that 3PLs need. Retail.Me is JDA’s far-reaching (and a refresh on their) retail and demand management solutions. Understand this: today’s merchandise, assortment and allocation systems define their planning around either product or store attributes. But neither of these ways of looking at the business reflects who the customer is and how they buy. No wonder the industry suffers from a glut of undesirable, unsold inventory! 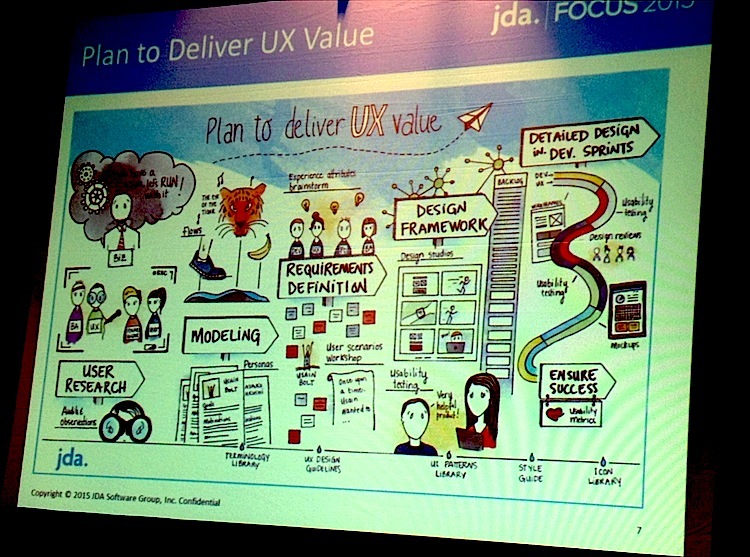 JDA aims to change that by putting the customer in the center of all their planning systems. This is exciting. Two years ago we predicted9 that someone would take on the challenge of changing demand management to reflect this. Many factors influence what we desire and purchase10 —the motivators, needs, budgets, and so on. Yet the systems nary address these. Today, though, with many new sources of data—social, search, location-based technologies, auto-id, visual and big data—the digital world can meet the physical world and allow us to obtain new insights for understanding the customer. Currently, JDA is looking to engage customers in a co-development approach to create retail systems that utilize customer segmentation methods that reflect the customers’ attributes. Customer attributes vary a great deal from business to business—we are not talking about relying on demographic data. Part of the approach will be to leverage internal data as well as use Google consumer analytics to help define customer segments. In addition, their UI group, which is actively working to create the next generation end-to-end merchandising systems (as we discussed above in the JDA Labs), can work directly with customers to help create the new user experience to drive applications. JDA Labs teams have embraced new UE/UI methodologies to capture that ‘day in the life’ of the user to understand their needs and challenges—on- and off-system. Examples of what the UI team—JDA Ghosts—look at: the user’s day journey, understanding people-to-people interactions and user-to-systems interactions and data;11 workflows; and the users’ ‘cognitive workload’ (all that thinking to get something done) to build the role-based personas around which the UIs will be designed. We saw several work-in-progress hints of new systems using these methods in retail systems and also in WMS. Retail technology has become a very competitive sector and these investments will take JDA a long way toward building loyalty within the current JDA customer base as well as allow them to compete with many of the innovative players in the market. JDA and the companies it acquired have been through some real ups and downs. Many of them started as very progressive, exciting, fast moving firms that rode the explosive growth of the tech wave/bubble during the late 90s, only to come crashing to the ground after the bubble burst. That was followed by a long period of rebuilding (and in some cases floundering, depending on which company and period we’re talking about). For a long time after some acquisitions, there persisted strong identification with the legacy companies within JDA—both by customers and by employees who would talk about each solution and each employee as coming from i2 heritage or Manugistics heritage or E3 or another origin. The old branding didn’t challenge that notion either and continued to tag line all the old companies. That way of thinking is changing too. New branding—JDA—and a common platform and UI for all the applications, plus a sense of unity within JDA is making it one company. Increasingly, there is a stronger core JDA identity. In our recent interactions with JDA’s employees and executives, it really does feel new. We found the management team to be refreshingly direct about the improvements that are needed and challenges faced, even as they strive to make these changes. There is a renewed sense of optimism. Many employees seem to genuinely enjoy working there again. It seems JDA is recapturing some of their old magic, but in a much steadier, stable, and grounded way. Many global supply chain people have a yen to achieve, to change the world. It takes a team, it takes vision and yes, it takes technology. JDA has been a part of that story for many firms for 30 years. 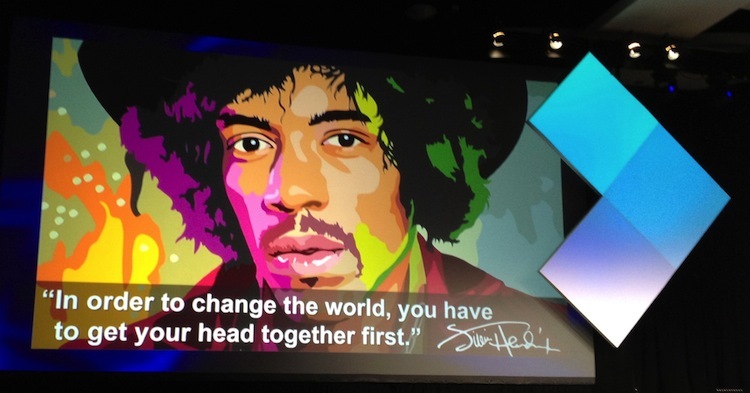 As John Washington of Edwards reminded us in his presentation, in the immortal words of Jimi Hendrix, “In order to change the world, you have to get your head together first.” (Italics are the author’s.) And that is exactly what JDA is up to.